You can now export the Roadmap board to share it with stakeholders who aren't members of your productboard project. 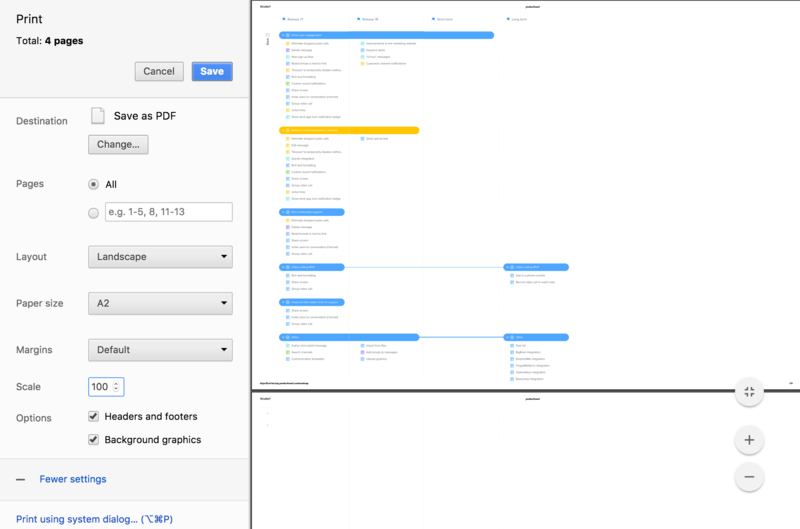 Export your roadmap as a PDF by changing the Destination to Save as PDF. To ensure your roadmap is not truncated horizontally, change the page layout from Portrait to Landscape. Increase the Paper size to increase the amount of information that will fit on every page. A0 is the largest paper size. A6 is the smallest paper size. If you're planning on printing your roadmap and don't have access to larger paper sizes, you can also modify the scale of your roadmap. Decrease the scale (zoom out) to show more of your roadmap in the same amount of space. You can convert a PDF to a paginated PNG, which can make it easier to edit in tools like Sketch, or share in tools like Powerpoint. On Mac OSX, open the exported PDF in Preview. Then export to PNG. On Windows, open the exported PDF in Microsoft Word or Adobe Acrobat Pro. Then export to PNG. You can import PDFs into Powerpoints as objects, where they can be opened from within a presentation. Note: Current technologies don't support exporting emojis. 😑 We regret to inform you that all emojis will need to be re-drawn by hand after roadmap printing.